My indie press is a place for experiments as much as a spot to publish my shorter work that doesn’t fit the traditional mode. This month, several projects I’ve been working on are finished and ready for sale. So many of you have asked for a print option for my short stories, and I listened. This hefty collection features 2 shorts (Gray Lady, Lady Gray and Catwood) and 2 novellas (The Endarkening and The Omen Days), and a sneak peek of LIE TO ME. And even more fun, I engaged the services of the brilliant Courtney Parker and Basil Sands to record the audiobook. So however you like to read, there’s a format especially for you. This is my first foray into publishing an actual novel, and I’ve been very excited by the response, especially in Germany. Having a book translated isn’t cheap, but if it continues to move copies, I may look at a few more translations in countries in which I sell well traditionally, especially French and Dutch. The book has a slightly different ending than its US counterpart, as well, so added bonus for you! The first anthology published by Two Tales features 13 southern gothic tales all centering around a single house. It’s a winner of a collection, with superb stories from a lot of my awesome writer friends. And it’s now available in a fabulous audiobook edition, read by Courtney Parker. There’s more to come from Two Tales this fall, including an anthology I am chomping at the bit to announce. Soon, lovelies, soon…. Thank you for supporting this fun indie venture. It means the world to me! 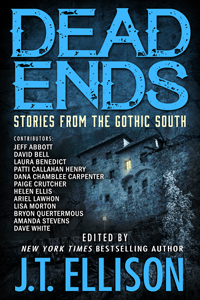 On sale now: DEAD ENDS, a Southern Gothic collection! I have a very exciting announcement. As you know, I have been stocking Two Tales Press with my own short stories exclusively. But no more! Today we are releasing the first Two Tales Press Anthology — DEAD ENDS: Stories from the Gothic South — featuring 13 original stories by 13 incredible authors. I approached some of my writer friends with the concept of writing a short story based on this photo, with the caveat that the story be gothic in nature and related to the south in some way. This all-star lineup proved my thesis perfectly. Their stories were so inventive and fun, creepy and profound, I decided to write one of my own to join in the fun! The American South is rife with stories of a haunted past—especially its houses. In this eclectic and impressive collection, thirteen novelists were asked to build their tales around the photo of a dilapidated mansion. They were given two requirements—the house must appear in the story, and it should be a Southern Gothic tale. And they delivered. From childish demons to a mad novelist, from the Mississippi delta to the Appalachians, this collection from emerging voices and New York Times bestselling authors explores what happens when secrets that lie beneath the dust are disturbed—and our worst nightmares begin. Darkness lurks behind every corner, especially dead ends. I can’t wait to get this incredible book into your hands. It will be available in both print and ebook September 28. You can request the physical book from your local indies, too! Just in time for Halloween reading…. A THOUSAND DOORS is now in audio! Happy Release Day, A THOUSAND DOORS!